← Our flowers have genes? I know that a swamp and a bog have lots of water, green plants and you really can’t walk in them. Well, unless you are someplace like Theodore Wirth Park in Minneapolis where the quacking bog has a floating walkway. 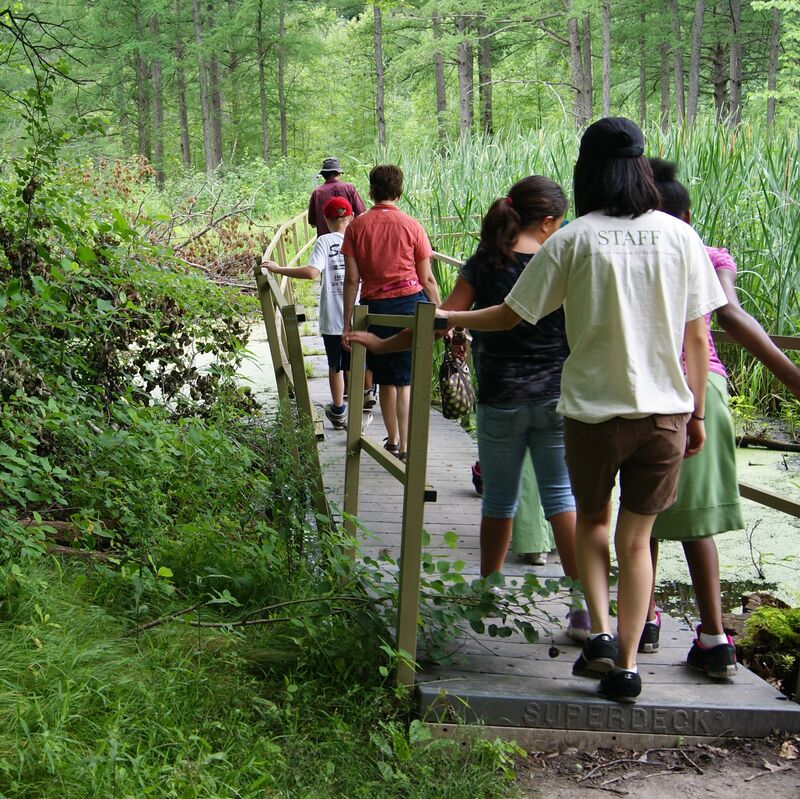 On my usual trip to Eloise Butler Wildflower garden I joined the summer school students from Marcy Open School on their walk through the quaking bog. There was so much to see and learn. There were lots of new words to think about – carnivorous plants, nutrients, conifer and deciduous trees, pollination, and sphagnum moss. I though a bog and a swamp were the same thing –a place with lot of water and plants. They are but you have to think about variation and adaptation. When we first entered the wetland area Lauren, our guide and botanist, asked us to look closely as we stood on the floating walkway. 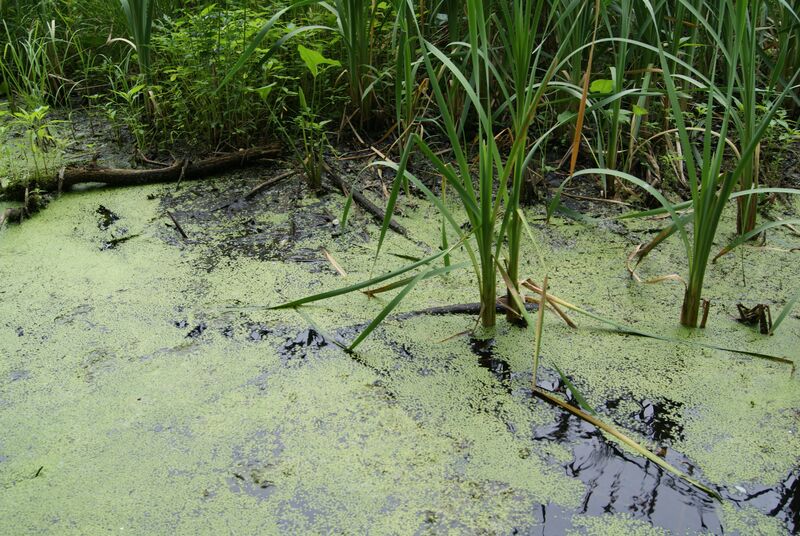 On one side we saw tall plants called Cattails and small green plants floating on the water called duckweed. This was the swamp. There was visible water for the duckweed, and mud for the Cattails. These plants have adapted to growing this environment with rich nutrients to feed on. The other side of the walkway we saw green moss called sphagnum moss, Arrow Head plants, Calla Lilies, and everything looked vey damp but no visible water. In fact it looked like we could go walking on the moss. It was thick layers of plants. Right there was my answer – this quaking bog was where we find layers of sphagnum moss that has built up over years, and years. It shakes and moves so it is called a quaking bog. It is sitting on top of water but the layers are very thick. In some areas you might be able to step on the moss but there is a chance of falling through and the water below the moss is very deep. There were many other plants growing on the moss and some of them are special plants that have adapted to this habitat. 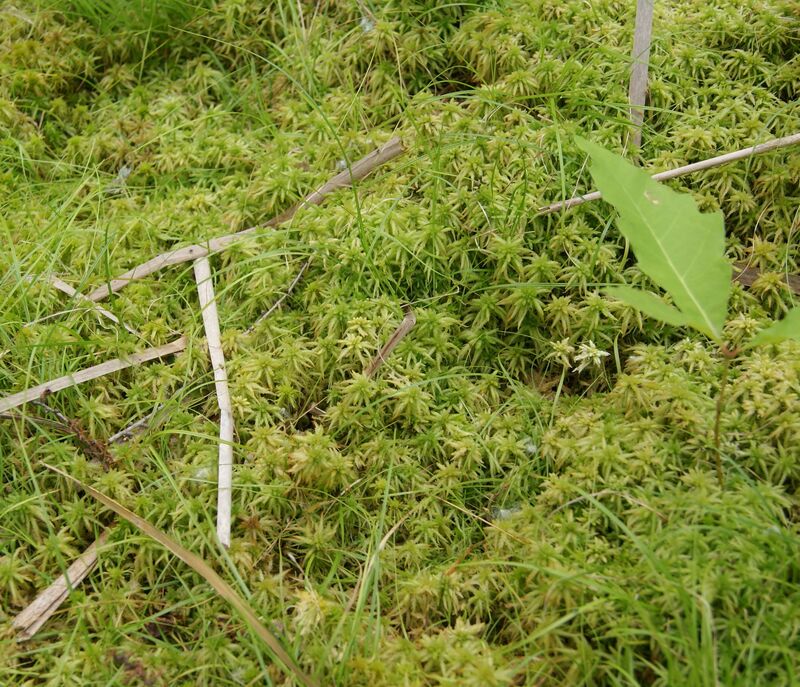 The sphagnum moss provides a nice place for plants to grow but no nutrients (food) to keep them a live. Plants need food as well as water and sun. 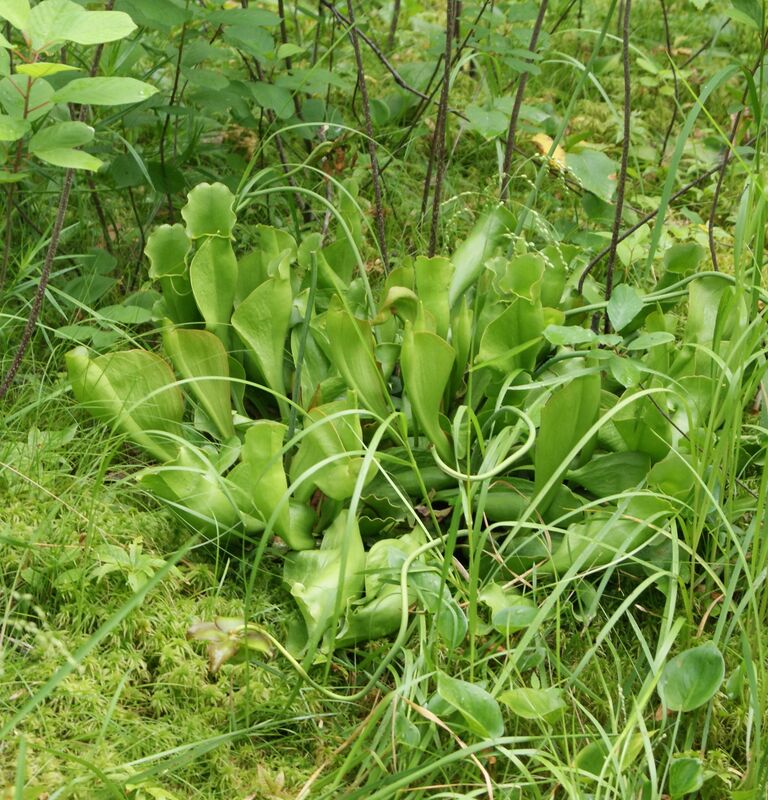 Some of the plants in the bog have adapted to this lack of nutrients by becoming carnivorous. The eat meat! Well – bugs really. We saw two of these carnivorous plants. 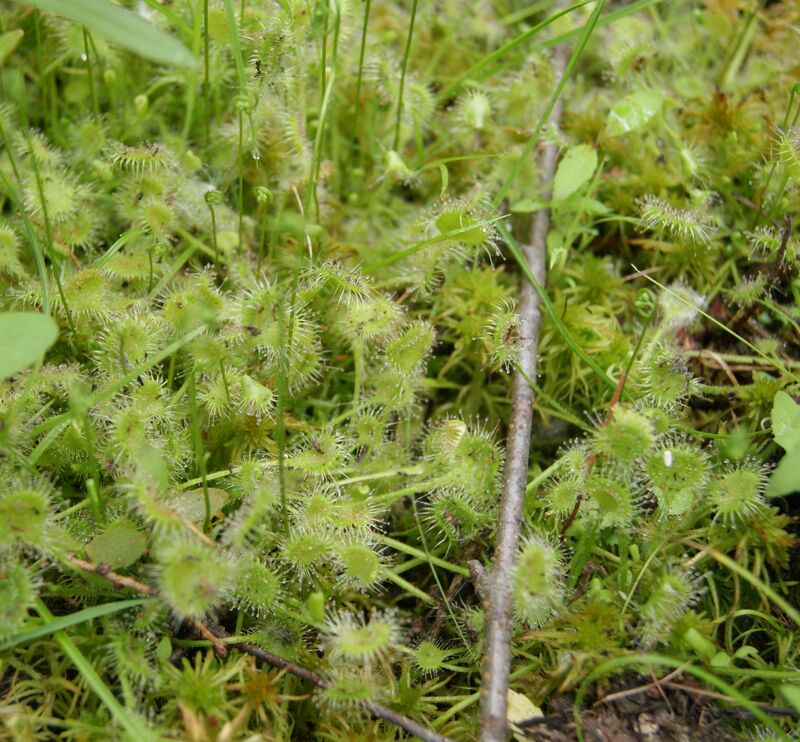 One was very tiny called a Sundew. You really needed to get down on your knees to see it. (That meant wet knees but it was worth looking at the plant close up) The other plant was a Pitcher plant. It was shaped like a large cone, which makes it easy for bugs slide into but not get out of. It makes an easy dinner for the plant. We had our science notebooks with us and tried to make some quick sketches of the plants to help us remember them. Once we get back to the classroom or home we can look up more information about these two plants to add to our notebook. If you are visiting the bog be sure to have your notebook along. What new questions do you have after visiting a bog? I have lots I am wondering about and will share with you in the next post. If you have drawings, questions or notes your would like to share from your visit to a bog send them to gardenlearning001@gmail.com. I will add them to the next post. This entry was posted in Garden Learning, journals, Reflections, science notebook, Uncategorized. Bookmark the permalink.